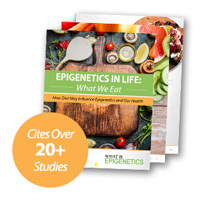 Epigenetics: Feeding the Obesity and Diabetes Epidemic? | What is Epigenetics? A new study by scientists from the Institute of Experimental Genetics at Helmholtz Zentrum München (Neuherberg, Germany) suggests that the metabolic consequences of mom and dad’s dietary habits can be inherited by their kids via epigenetic mechanisms. So in addition to inheriting a genetic risk factor in the classic sense, children can also inherit non-genetic information. If you consider DNA to be a “book of life”, the book handed down to the child is not necessarily a pristine copy – some passages may be highlighted, a page or two may be missing, or notes may be scribbled in the margins. In this study, mice were fed a high fat diet, became obese, and developed type 2 diabetes. Gametes were isolated from these mice, subject to in vitro fertilization, and then implanted into healthy female mice fed a normal diet. Despite being carried by healthy mothers, the children – especially the females – were still born predisposed to develop severe obesity. The unhealthy feeding behaviors of the biological parents had a negative impact on the children because the sperm and eggs contained heritable epigenetic information. This finding may open the door to new treatments for type 2 diabetes. Childhood obesity and type 2 diabetes have increased at alarming rates since the 1960s. According to the CDC, childhood obesity has more than doubled in children, spiking from 7% in 1980 to 18% in 2012. The 2014 National Diabetes Statistics Report estimates that 29 million Americans (over 9%) have diabetes. Ninety percent of these individuals have type 2 diabetes (adult onset diabetes), which arises when the body becomes resistant to insulin, the hormone produced by the pancreas to lower blood sugar levels. Chronically elevated blood sugar can lead to serious complications, including cardiovascular disease, nerve damage, blindness, and poor blood flow to the feet. Seeking an alternative explanation, their experiment examined epigenetic mechanisms. Rather than changing the DNA itself, epigenetics can alter the level of gene activation through methylation of DNA or modification of the histone proteins interacting with DNA. In addition, the RNA transcripts present in the oocytes and sperm may contribute to programming the zygote’s DNA. If epigenetic changes contribute to obesity or type 2 diabetes, then a new wave of therapeutics could be developed that focus on reversing these changes. Importantly, the study also serves as a demonstration that traits acquired by parents can be passed on to their children. Knowing that our behavior is programmed into our gametes may motivate both mom and dad to take even greater care of themselves before having children. The study was published March 14 in Nature Genetics. Reference: Huypens, P., Sass, S., Wu, M., Dyckhoff, D., Tschöp, M., Theis, F., Marschall, S., Hrabě de Angelis, M., Beckers, J. (2016). Epigenetic germline inheritance of diet-induced obesity and insulin resistance. Nature Genetics.